No matter what color your thumbs are, you can grow herbs with this innovative grow kit. What cook hasn't thought about starting a kitchen garden of aromatic herbs? But creating even a small one requires know-how. What seeds should you buy? Will they grow in your climate? What kind of soil should you use? How should you space them? LEED accredited architect Cam MacKugler's innovative container garden kits eliminate garden guesswork. 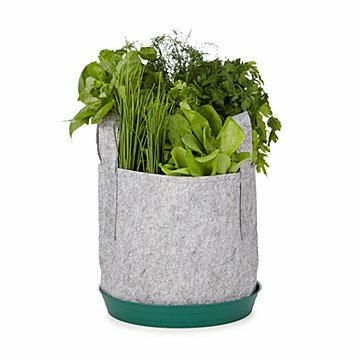 Each sheet is embedded with correctly spaced pods containing high quality seeds of six easy to grow, organic, and non-GMO aromatic herbs that grow well together: basil, cilantro, parsley, dill, green onion, and sorrel. Just put your nutrient-rich potting soil (not included) into the lightweight, flexible container, place the seed sheet (which also functions as a weed barrier) onto the soil, water, and put it in a sunny place to grow. Recipes and growing instructions by region included. Made in Middlebury, Vermont. Hungry for more? Check out our Taco and Hot Sauce seed sheet kits.